The first Lithuania stamps that were issued for the purpose of raising extra money for charitable purposes appeared in 1924. The early Lithuanian charity stamps were created by overprinting and surtaxing the regular definitive postage stamps of 1923. These so-called "semi-postal", "charity", or "surtaxed" Lithuania stamps are actually postage stamps, intended for use by postal patrons for various types of postal services. They feature a "value added amount" or "surtax amount", in addition to the postal denomination of the stamp, and this extra amount was donated to various public charities. 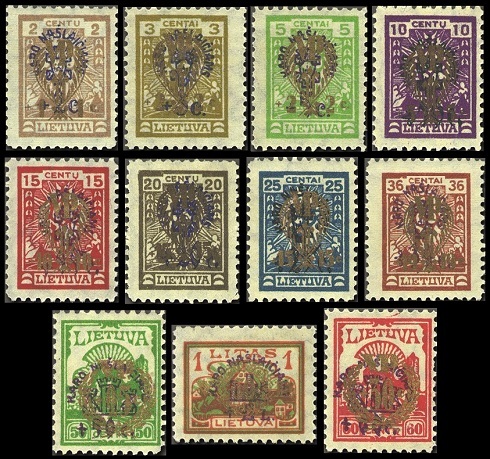 The thirteen major-type overprinted and surtaxed Lithuania stamps shown above were issued during February 1924. The surtax benefited war orphans. The semi-circular overprint is "KARO NASLAIČIAMS", meaning "WAR ORPHANS". The surtax amount appears below the overprint. The Scott catalog attributes, for Lithuania stamps that are watermarked with a parquet pattern and that are perforated 11, are as follows. 02 C. + 02 C. (1924 - Sc. #B1) - Pale Brown (Blue). 03 C. + 03 C. (1924 - Sc. #B2) - Olive Bister (Blue). 05 C. + 05 C. (1924 - Sc. #B3) - Pale Green (Violet). 10 C. + 10 C. (1924 - Sc. #B4) - Violet (Black). 36 C. + 34 C. (1924 - Sc. #B5) - Orange Brown (Violet). The Scott catalog attributes, for stamps that are watermarked webbing and that are perforated 11, are as follows. 10 C. + 10 C. (1924 - Sc. #B6) - Violet (Black). 15 C. + 15 C. (1924 - Sc. #B7) - Scarlet (Violet). 20 C. + 20 C. (1924 - Sc. #B8) - Olive Brown (Blue). 25 C. + 25 C. (1924 - Sc. #B9) - Blue (Black). 50 C. + 50 C. (1924 - Sc. #B10) - Yellow Green (Violet). 60 C. + 60 C. (1924 - Sc. #B11) - Red (Violet). 01 L. + 01 L. (1924 - Sc. #B12) - Orange & Green (Violet). 03 L. + 02 L. (1924 - Sc. #B13) - Red & Gray (Violet). 05 L. + 03 L. (1924 - Sc. #B14) - Orange Brown (Violet). The Scott catalog attributes, for stamps that are unwatermarked and that are perforated 11, are as follows. 25 C. + 25 C. (1924 - Sc. #B15) - Blue (Black). 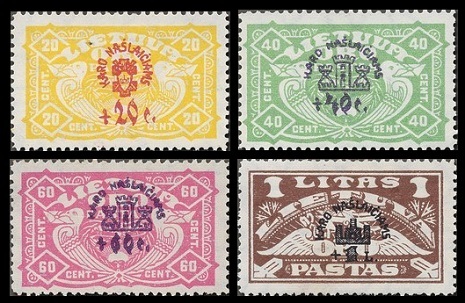 The four major-type overprinted and surtaxed Lithuania airmail stamps shown above were issued during March 1924. The surtax on these airmail stamps also benefited war orphans. 20 C. + 20 C. (1924 - Sc. #CB1) - Yellow (Red). 40 C. + 40 C. (1924 - Sc. #CB2) - Emerald (Violet). 60 C. + 60 C. (1924 - Sc. #CB3) - Rose (Violet). 01 L. + 01 L. (1924 - Sc. #CB4) - Dark Brown (Black). 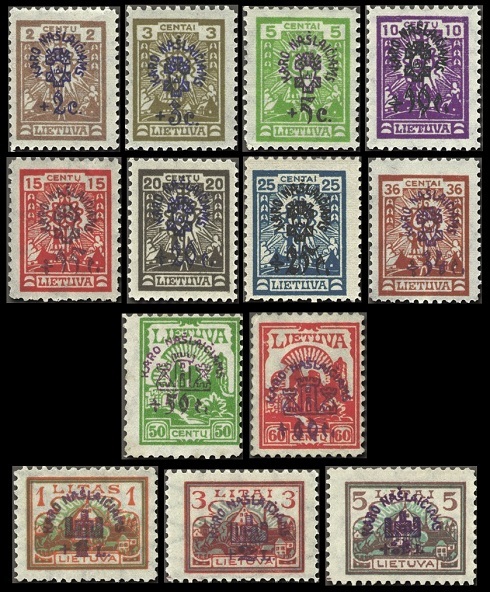 The ten major-type overprinted, re-valued, and surtaxed Lithuania charity stamps of 1924 shown above were issued on December 3, 1926. The surtax benefited war invalids. The original 1924 semi-circular overprint is "KARO NASLAIČIAMS", meaning "WAR ORPHANS". The stamps are re-valued and surtaxed in gold, copper, or silver inks. The Scott catalog attributes, for Lithuania stamps that are watermarked with a parquet pattern, are as follows. 01 C. + 01 C. on Sc. #B1 (1926 - Sc. #B16) - Pale Brown. 02 C. + 02 C. on Sc. #B2 (1926 - Sc. #B17) - Olive Bister. 02 C. + 02 C. on Sc. #B3 (1926 - Sc. #B19) - Pale Green. 05 C. + 05 C. on Sc. #B4 (1926 - Sc. #B20) - Violet. 14 C. + 14 C. on Sc. #B5 (1926 - Sc. #B21) - Orange Brown. The Scott catalog attributes, for stamps that are watermarked webbing, are as follows. 05 C. + 05 C. on Sc. #B6 (1926 - Sc. #B22) - Violet. 05 C. + 05 C. on Sc. #B7 (1926 - Sc. #B23) - Scarlet. 10 C. + 10 C. on Sc. #B8 (1926 - Sc. #B24) - Olive Brown. 10 C. + 10 C. on Sc. #B9 (1926 - Sc. #B25) -Blue. 20 C. + 20 C. on Sc. #B10 (1926 - Sc. #B27) - Yellow Green. 25 C. + 25 C. on Sc. #B11 (1926 - Sc. #B28) - Red. 30 C. + 30 C. on Sc. #B12 (1926 - Sc. #B29) - Orange & Green. The Scott catalog attributes, for stamps that are unwatermarked, are as follows. 10 C. + 10 C. on Sc. #B15 (1926 - Sc. #B26) -Deep Blue. 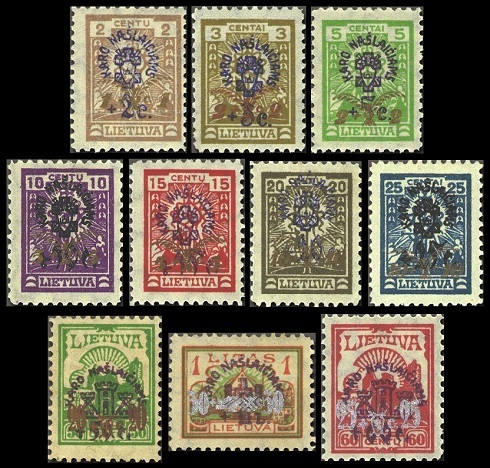 The eleven major-type overprinted, re-valued, and surtaxed Lithuania charity stamps of 1924 shown above were also issued on December 3, 1926. The surtax benefited war orphans. The stamps are all overprinted, re-valued, and surtaxed in gold. The overprint consists of a large wreath, with the initials "VP". 01 C. + 01 C. on Sc. #B1 (1926 - Sc. #B30) - Pale Brown. 02 C. + 02 C. on Sc. #B2 (1926 - Sc. #B31) - Olive Bister. 02 C. + 02 C. on Sc. #B3 (1926 - Sc. #B32) - Pale Green. 05 C. + 05 C. on Sc. #B4 (1926 - Sc. #B33) - Violet. 19 C. + 19 C. on Sc. #B5 (1926 - Sc. #B34) - Orange Brown. 05 C. + 05 C. on Sc. #B6 (1926 - Sc. #B35) - Violet. 10 C. + 10 C. on Sc. #B7 (1926 - Sc. #B36) - Scarlet. 15 C. + 15 C. on Sc. #B8 (1926 - Sc. #B37) - Olive Brown. 15 C. + 15 C. on Sc. #B9 (1926 - Sc. #B38) -Blue. 25 C. on Sc. #B10 (1926 - Sc. #B40) - Yellow Green. 30 C. on Sc. #B11 (1926 - Sc. #B41) - Red. 50 C. on Sc. #B12 (1926 - Sc. #B42) - Orange & Green. 15 C. + 15 C. on Sc. #B15 (1926 - Sc. #B39) -Deep Blue.